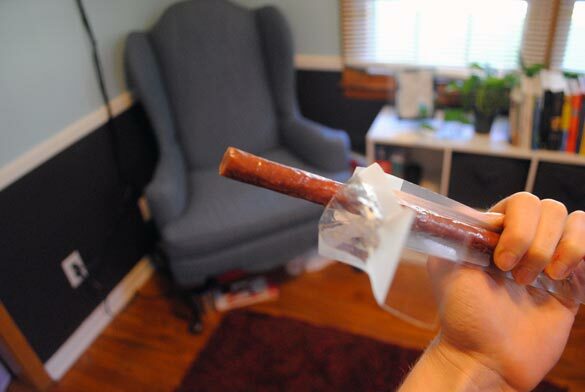 I won’t name names, but there are some big jerky companies that I really, really wish would take gluten out of their beef sticks and jerky. I mean, it’s supposed to be dried meat with spices — what the heck is gluten doing in there anyway? 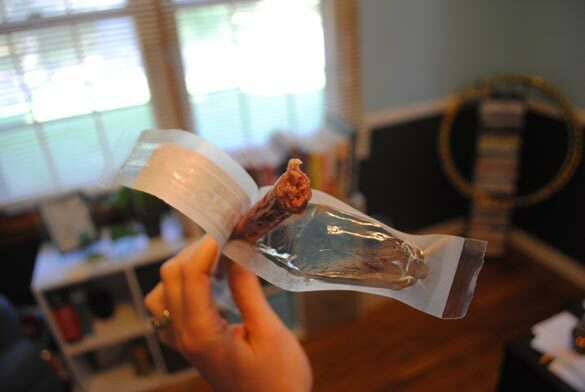 And jerky is such a great high-protein snack. You can take it anywhere! 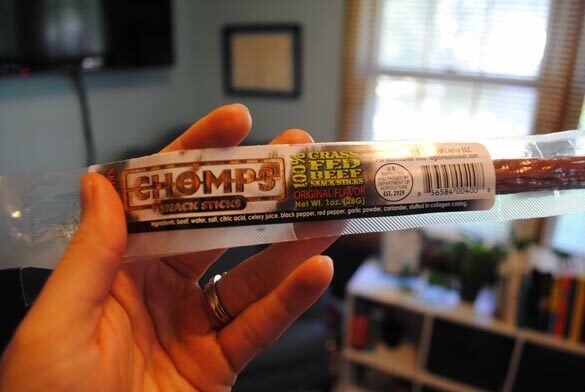 So when these Chomps Snack Sticks landed here at FBE HQ, it was a happy, happy high-protein day for me. Gluten-free, sugar-free, Paleo-friendly and Whole30-approved with no artificial nitrates or preservatives, these are even made of 100 percent grass-fed beef that’s locally sourced and produced in the Midwest (you know that made my heart sing!). And, guys, look at the nutritionals. Yes, the sodium is high for an 80-calorie snack and there is some saturated fat, but for a beef stick, you cannot beat the ingredient list. It goes: (Grass-fed) beef, water, salt, citric acid, black pepper, red pepper, garlic powder, coriander, stuffed in a collagen casing. And the taste? I can so dig it. With a slightly chewy exterior, it’s spicy but not too spicy, and tastes just like you’d expect from that ingredient list. Filling and satisfying! My dad and I used to always get jerky or a beef stick when we’d go out fishing when I was younger, so I’m happy that this nostalgic snack for me is making a comeback in my gluten-free lifestyle. 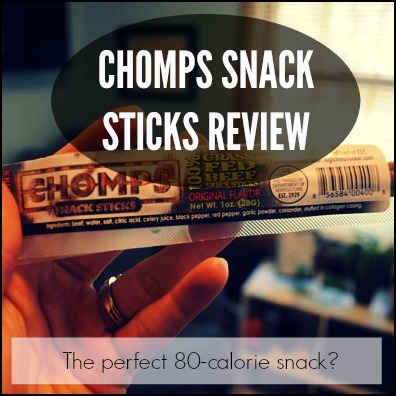 And at about $2 per Chomps Snack Stick, it’s totally affordable. And, it’s really fun to say “chomp.” Chomp, chomp, chomp!